This one bedroom, 4 star lodge with electric heating and double glazing throughout is within easy walking distance of Keswick town centre. It offers a relaxing, quiet location in picturesque surroundings with magnificent views to Latrigg, Skiddaw and the surrounding fells. The lodge is warm and comfortable, with Electric, coal burning effect, stove and fire surround. French doors opening onto its veranda to get the most from the views. Private parking is provided adjacent to the property. Bathroom with bath and electric shower over bath. Toilet and sink. Mirror and shaver point. Electric towel rail. This is under the control of our guests and is included in the price. There is a fireplace with an electric coal effect burner. Internet is available through BT Fon. This is free to BT customers. It is not provided by ourselves and we do not offer any guarantees in respect of connectivity. Towels can be provided at an additional cost. Galley style, well equipped fitted kitchen, includes 4 electric ring hob and oven, fridge freezer, microwave, toaster, kettle, washing machine, dish washer. Full set of crockery and utensils. The dining room table is incorporated in to the lounge/living area, which opens on to the veranda. There there are views of the surrounding fells. books on the area and fictional books are provided. Jenga, scrabble, dominoes and jigsaws. full French doors open on to private veranda. Available for rent at Derwentwater. The veranda, with outside furniture, has excellent views of the surrounding fells, it looks towards Skiddaw and Latrigg. Full set of patio doors opens on to the veranda. Keswick golf club is 4 miles away. The Silloth links golf course is 25 miles. The clubs of cocker mouth and Maryport are 11 and 20 miles respectively. The lodge is not suitable for wheel chair users. There are four steps to the lodge. Outside: The property is surrounded by greenery. It is a small, quiet complex with approx 30 cabins. There is parking for 2 vehicles adjacent to the property. The veranda has table, chairs and potted plants. Cleaning / Towels / Linen / Maid service: All bed linen is included. Towels are not included but can be hired at an additional charge. We really enjoyed our stay here. 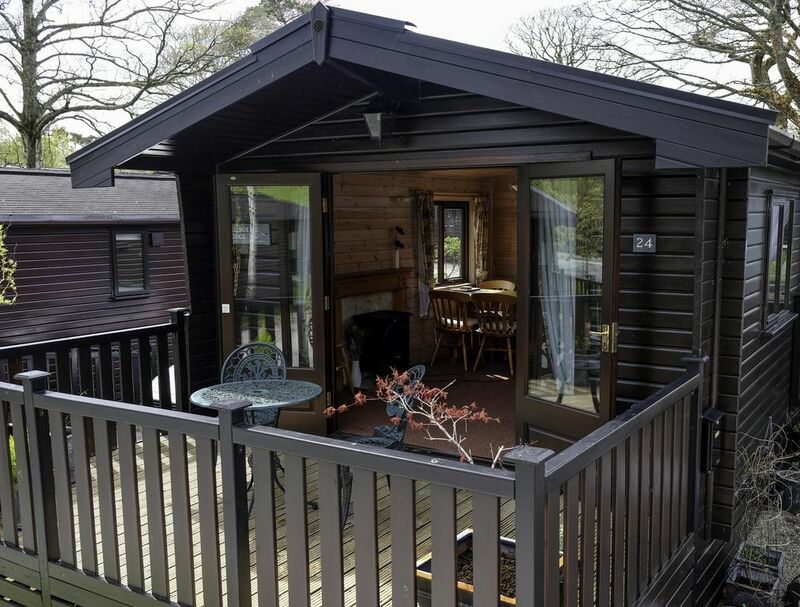 It’s ideally located for Keswick and just off A66 to go further afield. The lodge is warm, cosy and clean. We would stay again. Glad to hear you enjoyed your stay at Fellside Lodge and look forward to your return. Glad to hear you both felt peaceful and relaxed. As you say it is a magical place. Happy to hear you enjoyed your stay, it is important to arrive to clean accommodation. We stayed for one night with a 6 year old son. We had a lovely time . The lodge is very clean and very comfortable. Will love to come back again soon . Thank you. Glad to hear, you loved it. It doesnt matter how long or short our guests stay we want them all to be comfortable and enjoy the surroundings. Keswick is set in the Heart of the Lake District, within easy reach of all it has to offer. Keswick is approximately 30 minutes drive to the Western Coast of England. The shallow beach of Allonby is ideal for kite and wind surfing. St Bees is the start of the Coast to Coast route and Whitehaven is home to a Harbour and Marina. Booking Notes: To secure a booking we kindly ask for a deposit of £100, the balance is payable 6 weeks prior to arrival. Bookings made within 6 weeks to arrival date require payment in full. We accept payment by bank transfer or cheque. Cancelation policy: The £100 deposit is non-refundable,cancellations made within the 6 week period prior to arrival will incur no refund. If the original holiday period is re-let the rental payment paid will be carried forward to an alternative holiday period, less any additional costs incurred. Changeover Day: Change over day is Saturday. Short breaks are available in low season and last minute availability. Notes on prices: Prices are based on 2 people sharing for the week, all bed linen and utilities are provided. There is a bed settle in the lounge, there is an additional charge for a 3rd person staying as follows:- infants no charge persons up to the age of 14 - £15 persons between the age of 14 and 16 - £50 persons over the age of 16 - £75, prior arrangement only.